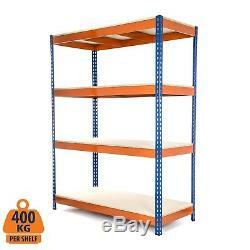 4 Tier Steel Shelving Heavy Duty Garage Storage Racking Blue & Orange 400KG UDL. Heavy Duty Steel Shelving Unit 1800mm H x 1500mm W x 600mm D 400KG UDL. This fantastic shelving unit is ideal for the garage, workshop, or small warehouses, if you are looking for a professional product to hold a high capacity load per shelf this is the range for you. With solid 15mm chipboard shelves, and two central support beam these can hold a load capacity of 400kg UDL and with 4 levels they are ideal for all storage needs. An Amazing 400kg UDL per shelf. Each shelf is Solid 15mm Chipboard sheet. Made from 1.5mm thick Graded Steel. Powder coated in a Blue & Orange Gloss for long lasting finish. Two Support on each shelf for added Strength. Each upright is one piece. Adjustable shelf height every 45mm. Supplied with plastic feet and top caps. Tested & certified to EU & International Manufacture & safety standards. Boltless easy to assembly, tap together with a rubber mallet. Shelf surface 1495mm W x 595mm D. Assembled dimensions 1800mm H x 1500mm W x 600mm D. Box Weights: Metal 29kgs, Chipboard 39kgs. Any product you return must be in the same condition you received it and in the original packaging. Heavy Duty Steel Shelving Unit 1800mm H x 1500mm W x 600mm D 400KG UDL Product Information: This fantastic shelving unit is ideal for the garage, workshop, or small warehouses, if you are looking for a professional product to hold a high capacity load per shelf this is the range for you. The item "4 Tier Steel Shelving Heavy Duty Garage Storage Racking Blue & Orange 400KG UDL" is in sale since Tuesday, September 19, 2017. This item is in the category "Business, Office & Industrial\Retail & Shop Fitting\Shelving & Racking". The seller is "shelf_racksolutions" and is located in Castleford. This item can be shipped to United Kingdom.